The rich Republican history of fighting for civil rights for blacks was stolen by Democrats. That theft reminds me of Hitler’s moustache. There was a time when everybody knew that Republican Party was the party of civil rights. How does a party founded as the “anti-slavery” party lose that distinction? When racist Democrats were implementing Jim Crow laws with Black Codes, and lynching black people, Republicans were imposing legislation to stop them. From 1866 to 1964 the Civil Rights acts all belong to the Republicans. One Civil Rights Act was dedicated to stop the lynching of black people. Yes, Republicans actually found it necessary to legislate that Democrats stop hanging black people. The Dyer Anti-Lynching Bill was introduced by Representative Leonidas C. Dyer, a Republican from Saint Louis, Missouri, in the US House of Representatives in 1918. Republican President Warren G. Harding announced his support for Dyer’s bill during a speaking engagement in Birmingham, Alabama. Although the bill was quickly passed by a large majority in the House of Representatives, it was prevented from coming to a vote in 1922, in 1923 and once more in 1924 in the Senate, due to filibusters by the white racist Southern Democratic block. “I did not choose the tools with which I must work…Had I been permitted to choose them I would have selected quite different ones. But I’ve got to get legislation passed by Congress to save America. Stupid me. I thought the president’s first priority was to protect the citizens of America from enemies foreign and domestic. I guess that was difficult for a racist Democrat president to do, since he and his party were (and continue to be) the enemy of blacks. Democrat oppression caused the Great Migration, where 6.5 million blacks left the South, moving to the Midwest and the North in order to escape lynching and to find jobs. Had not the great legacy of civil rights not been stolen from Republicans by Democrats, blacks would be voting overwhelmingly for Republicans today. Which brings me to Hitler’s mustache. Everybody recognizes the iconic Hitler mustache – shaved at the edges, except for a half-inch patch above the center of the lip, sides of the mustache vertical rather than tapered. No description needed, right? Yet nobody wears the Hitler mustache anywhere in the world. That mustache style is now, and likely forevermore, persona non grata. Prior to Hitler, that style of mustache had many names. It was called toothbrush mustache, 1/3 mustache, philtrum mustache, the postage stamp, soul mustache. And finally the “Charlie Chaplin, made famous when Charlie Chaplin adopted it sometime after 1914 for his silent comedies. 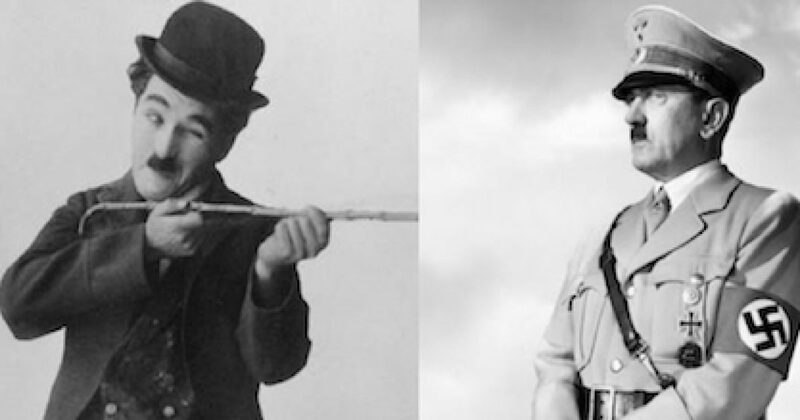 In a 1933 interview, Chaplin said he added the mustache to his costume because it had a comical appearance and was small enough so as not to hide his expression. 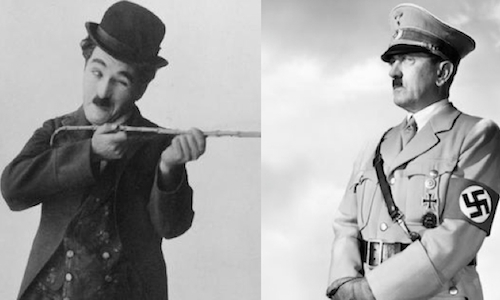 Adolf Hitler was a fan of Chaplin, but there is no evidence that Hitler modeled his ‘stache on that of Charlie Chaplin, though Hitler later adopted the style, in effect stealing it from Chaplin. Who knows what would have happened to the Charlie Chaplin had Hitler not stolen it. Republicans should be asking themselves the same question regarding the theft of their history of fighting for civil rights. Where would Republicans be if people knew the truth about Republicans being the party of civil rights? The racist Democrats used Hitlerian tactics to steal something good, and like the Hitler did to the Charlie Chaplin mustache, Democrats have made a mockery of civil rights. David M. Kennedy, Freedom From Fear: The American People in Depression and War, 1929-1945(Oxford, 1999), 210.